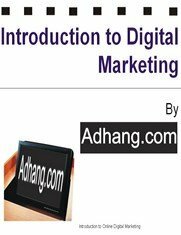 The E-book “Introduction to Digital Marketing” is an ebook written to answer many digital marketing questions – whether you’re professional, company, organization, or just want to learn about digital marketing. The eBook is written using simple, straight to the point approach, and a balanced digital marketing in mind. It looks at many areas of digital marketing as in practice in today. The eBook is free to download. Click on the e-book below to download.